When it comes to delivering new technologies HP is never late, so is the case with HP LaserJet 1000w printer, as it stands out to be the best in both, design and functional perspective. This is an inexpensive laser printer aimed to serve home users. The look and feel of HP LaserJet 1000w is quite innovative. Along with the modern and structured design, the simplicity of the device is also retained which is the prime concern as per the user's ease. The HP LaserJet 1000w printer comes in white colour providing a user interface that is quite attractive and simple to operate. 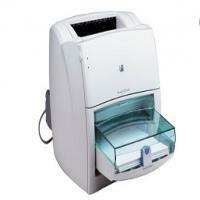 It supports wide range of media types such as cards, envelopes, labels, plain paper and transparencies. The maximum resolution for black and white colour files is 600 dpi. The LaserJet 1000w can store up to 250 sheets of paper. The maximum printing speed of the device is 10 ppm (pages per minute) for monochrome documents. This 8 kg device measuring 48.6 x 41.5 x 25.3 cm can print large number of images even after the ink in the HP LaserJet 1000w toner cartridge begins to shrink. HP LaserJet 1000w printer has everything to offer from supporting various media types to an effective and affordable price that could benefit home users. Anyone requiring a simple all in one printer will not be disappointed by the HP LaserJet 1000w. How to fix gray background print issue of your HP LaserJet 1000W? I bought an HP LaserJet 1000W printer a few months ago. It has been working great till last night. Yesterday when I was printing my school assignment, it started producing prints with a gray background. It took me the whole night to figure out the issue and come to a perfect solution. Finally, with the help of HP support, I fix my printer and got proper printouts for the assignment. With all that struggle I am now a pro to handle this issue and sure can help you out if you are also facing such issue. First of all before you proceed with the troubleshooting steps below, make sure you are using good quality HP LaserJet 1000W toner cartridge. You can also check if the HP LaserJet 1000W Toner Cartridge is placed properly and is not damaged or leaking. If you find any fault with the cartridge, you need to replace this one first before you proceed. If none of the above steps work, you would need to install a new HP laserjet 1000w toner cartridge. Q. How many pages can the input tray of the HP LaserJet 1000w printer handle? A. The input tray capacity of the HP LaserJet 1000w printer is 250 sheets. Q. A multipack of HP15A toner cartridges was delivered to me yesterday but the name of my printer HP LaserJet 1000w was not written on the box. Does this mean that I’ve ordered the wrong cartridges for my printer? A. HP15A toner cartridges are compatible with a wide range of HP printers. If the name of your printer is not mentioned on the box, it does not mean that these cartridges are not compatible with your printer. However, if you still have any doubts and want to check before unpacking the product, please call us on 048 30833221 or email us at info@printerinkcartridges.ie . Q. Is there any risk in using your compatible HP LaserJet 1000w toner cartridges instead of the original ones? A. There is absolutely no risk in using our compatible cartridges. These cartridges are FSC tested products and rigorously factory tested to the same ISO standard as the original brand toner. Furthermore, our products come with a warranty period, thus ensuring their quality. Q. If my order of HP LaserJet 1000w toner cartridges turns out to be damaged, can I return it for a refund or replacement? A. We are extremely sorry to hear this. You need to contact us by telephone on 048 30833221 or email us at info@printerinkcartridges.ie . Damaged items need to be returned to the address: Wholesale Ink Ltd, 25 Kilmorey St, Newry, Co Down, BT34 2DF. We will then arrange for a replacement or a refund for the cartridges and the postage incurred by the customer for returning the item once the item has been returned to us and tested for damage. A. This HP printer consumes 7.6 Watt on Standby / Sleep mode and 214 Watt during operation. Q. What are the perks offered by HP LaserJet 1000w printer? It supports wide range of media types such as cards, envelopes, labels, plain paper and transparencies. Q. I’m unable to find coloured HP LaserJet 1000w toner cartridges for my HP LaserJet 1000w printer. Can you help me in finding one? A. This is a monochrome printer that only supports printing through black colour cartridges that's why we do not sell coloured ink cartridges for HP LaserJet 1000w printer. Q. Where can I find HP LaserJet 1000w toner cartridges at your site and how to order them? A. You can find the toner cartridges for your printer at: https://printerinkcartridges.ie/hp-inkjet-cartridges/hp-laserjet-printers/laserjet-series-1000-2999/laserjet-1000w Once you find the ink cartridge, it is very easy to order them. With the details about the product given, there is an option “ADD TO CART” shown in the yellow box. For adding the items, you just need to click that box specifying the quantity you need and proceed to the checkout. Once you move for checkout fill up all your details and then pay for the item. Q. How can I pay for my HP LaserJet 1000w toner cartridges? A. You can pay by using Laser Card, American Express, MasterCard or Visa credit card, Maestro, Switch, Solo or Delta debit card at Printerinkcartridges.ie . We ensure maximum security of your credit/debit card details. Q. Are the cartridges at your site 100% guaranteed and certified? A. Yes, the cartridges at our site are 100% guaranteed and FSC certified and tested. Q. Do you offer any discount if I am ordering for the first time from this site? A. Yes, we offer 10% discount on your first order. You need to apply Coupon Code - D10 at checkout. Q. Does the HP LaserJet 1000w printer able to handle different media types or there is only some specific one? A. Yes, the HP LaserJet 1000w printer is able to handle different media types such as cards, envelopes, labels, plain paper, transparencies. Q. I have recently installed the compatible HP LaserJet 1000w toner cartridges in my HP LaserJet 1000w printer but it is not getting recognized. How to resolve this? A. Please refer the user manual for HP Laserjet 1000w printer for step by step instructions. Q. The prints on the document are very light than expected. So how can I improve the print quality? Check if the toner supply is low. Refer Managing the HP LaserJet 1000w toner cartridge section from the user manual. Check if the media type is correct or not. If the whole page is light, the print density adjustment is too light or EconoMode might be turned on. Refer the user manual for step by step instructions. Q. What is the maximum print resolution that I can expect from the HP LaserJet 1000w printer ? A. The maximum print resolution offered by the HP LaserJet 1000w printer is 1200 dpi. Q. What are the dimensions of HP Laserjet 1000w printer? Also, I want to know how much printing speed is offered by the HP LaserJet 1000w printer? A. The printer measures 415 x 486 x 253 mm in width, depth, and height and the maximum print speed offered by this printer is 10 pages per minute. Q. During printing on the document, vertical lines appear in between the texts. How to remove this? Ensure that the input tray cover is in place. There are chances that the photosensitive drum inside the HP LaserJet 1000w toner cartridge has been scratched. So you have to install a new HP toner cartridge. Refer the user manual for step by step instructions. Q: I wanted to estimate the efficiency of one cartridge for my office so that we can order cartridges accordingly. Can you tell me how many copies can I get from the HP LaserJet 1000w toners? A. HP LaserJet 1000w is a monochrome printer whose cartridge produces 3500 prints approximately. This is based on printing 5% coverage on an A4 page, but if you print more than 5% than the page yield will decrease accordingly. Q. What are the choices of colours of the compatible HP LaserJet 1000w toner cartridges offered by your site? Both cartridges are equally compatible and efficient with the printer. Q. I got 15A cartridge with my HP LaserJet 1000w printer. It has exhausted and now I was willing to buy your compatible 15X cartridge. Will it be equally efficient as the previous ones? A. 15X HP LaserJet 1000w toner cartridges are very efficiently compatible with HP LaserJet 1000w printer. There is no physical difference between the two, only 15X has more ink and cartridge printing power therefore it yields more prints than the 15A cartridges. Q. Can you tell me about the supported page sizes for my HP LaserJet 1000w printer? Q. Would you recommend me buying HP LaserJet 1000w printer for my office? The amount of documents we print daily is extremely abundant and we are looking for a printer that can work efficiently. A. HP LaserJet 1000w is a highly efficient printer which is a great deal for users using it in office. This monochrome printer prints clear and sharp text. Using HP LaserJet 1000w toner cartridges enhances the colour and brightness of text making the document to look more appealing. For your usage HP LaserJet 1000w is a good printer. Q. Are there any other printers which can use your compatible HP LaserJet 1000w toner cartridges? Q. My HP LaserJet 1000w printer lately has started spilling ink. Whenever I print the documents the clarity is not as it used to be. What can be wrong? A. The spilling and unclear prints is a sign of clogged print heads or broken printheads. We would recommend you to perform cleaning of print heads and restart your printer. If the problem still persists you should get your printer repaired. The unclear prints is usually not a sign of faulty cartridge, however, you can check the cartridge level and replace them if they are low on toner. Also, make sure that the paper type is supported by the printer.